A wet bag is a place to put the wet diapers when you are on the go. Wide opening for easy access. Wide opening at the top for easy use. 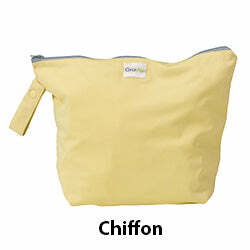 Keep your cloth diapers and accessories secure with this durable zippered wet bag. A wet bag is a cloth diapering necessity. This versatile tote features a simple, yet effective design that tucks conveniently into your diaper bag when on the go. Easy-to-use, zippered closure. Convenient loop handle. Holds 4 to 6 diapers. Water-resistant. Just it throw in the wash. 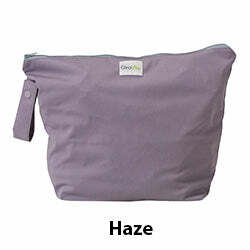 Packs up small and is easy to use with zippered closure. Coordinates with your other GroVia items and GroVia Swim Diapers. Dimensions: 12"H x 12"W Materials: 100% Polyester TPU Fairly and conscientiously made in China. But it is clearly well constructed and I am sure will do the job. Nice bag! Holds 4 diapers just fine with extra room (haven't tried more). I like the cute prints. This is the best bag we have used so far. It holds everything in, no leaking. We line dry and it dries quickly. Love it and would like to order more. Great medium wetbag. Perfect for a day out! I haven't actually used this yet as my baby isn't due for another few weeks, but let me just say that this is one super cute wetbag! It seems to be made extremely well, the fabric is adorable, (I got one in the print "Grapefruit Stars") and it's the perfect size for a day out. I can see it fitting 6+ newborn AIO diapers easily. Overall super happy with it already!